Shaft melting furnace with a vertical, tubular shaft. Examples are blast furnaces, cupolas and aluminium shaft melting furnaces, but also thermal treatment furnaces with a cylindrical, shaft-like structure and air circulation. Shaft melting furnaces are used in aluminium foundries, especially in die casting foundries, for high requirements for metal quality, melting performance and rentability. Fig. 1 schematically illustrates the constructive structire of a fuel-heated shaft melting furnace for melting and holding aluminium alloys. Thanks to a special shaft geometry and especially adapted burner technology process steps such as preheating, heating and liquefaction can be combined in one melting shaft. The molten material is added in a cold state in the shaft, sinks down the shaft and is heated up during sinking. Ascending flue gasses on the fuse link resulting from the melting process are cooled, i.e. the shaft furnace funtions in a favorable counter flow principle relating to warmth. The heat transfer occurs through convection ensuring a heat exchange at low temperatures. On the fuse link at the shaft base, the material is heated up to the extent that a quick melting takes place. For this reason, the time the metal spends in the high temperature area with an immedate pressurizing by burner gasses is low which has a positive effect on the burnout. Explosions due to humid molten material are impossible. 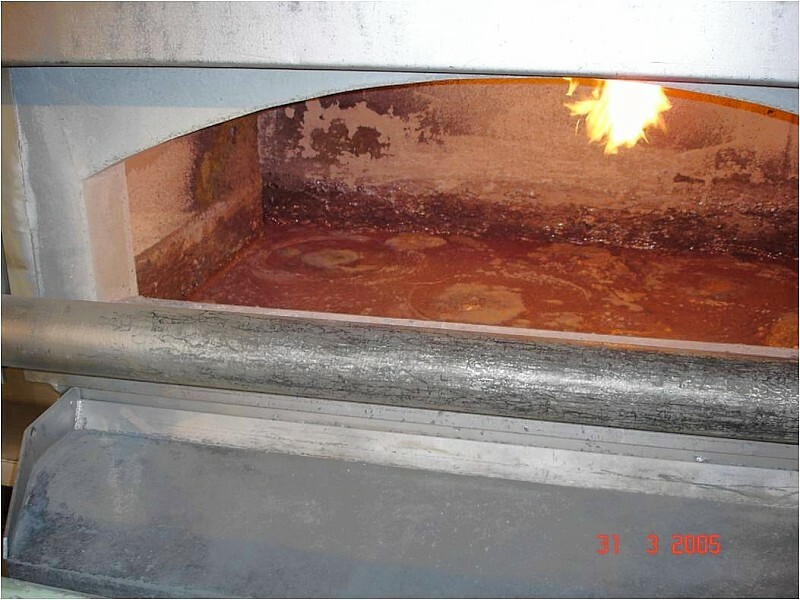 The molten material flows without turbulances and dross from the fuse link to the trough-shaped holding room where the selected tapping temperature is maintained. With larger machines, metal tapping normally occurs via a hydraulic tilting arrangement of the furnace (Fig. 2), with smaller machines a tapping valve is used (Fig. 3). These plants have a hgh automisation degree. The feeding point can be directly determined through material level monitoring in the shaft or indirectly through analyzing the flue gasses temperature. 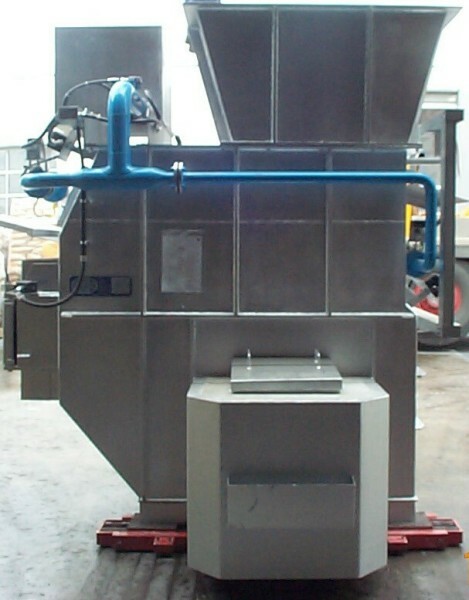 The feeding material (block or cycle material) only has to be added to the furnace feeding device. This is done directly into the load-carrying attachment, either manually in feeding trolleys or through fork-lift trucks Charging starts automatically upon furnace control request. The furnace structure with separate burner devices for the melting shaft and/or the holding part ensures a continuous metal discharge with a temperature tolerance of ± 5°C and enables a flexible metal supply for the foundry as an important requirement for a good efficiency. The twin-chamber furnace concept with a fuse link and a separate holdingbath results in a high metal quality. The melt only shows low concentrations of suspensed, unsoluble impurities and the oxygen content lies below the solution equilibrium. Typical aluminium die casting alloys such as VDS 226, 230, 231 and 239 can be melted in such shaft furnaces with a high metal yield so that the operator is totally satisfied. 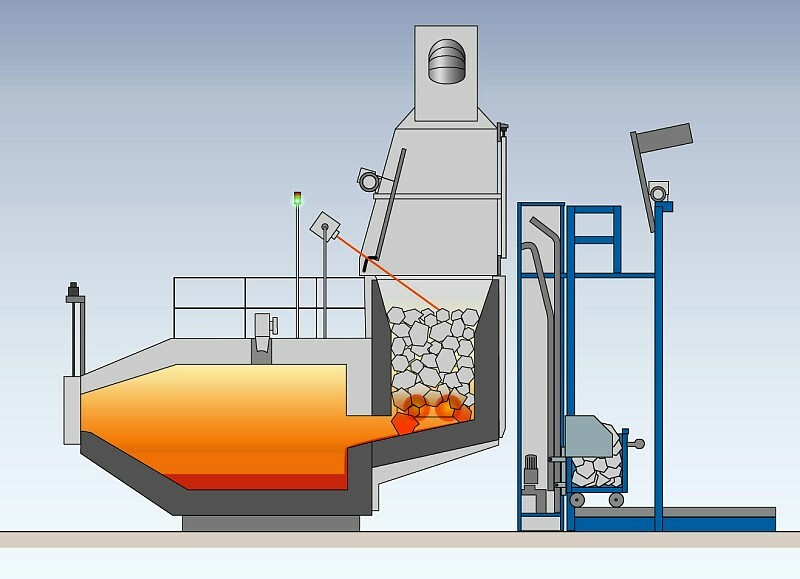 Therefore, this furnace type represents the ideal melting aggregate for many die casting foundries. However, we do not recommend to melt extremely fine return scrap such as chips. 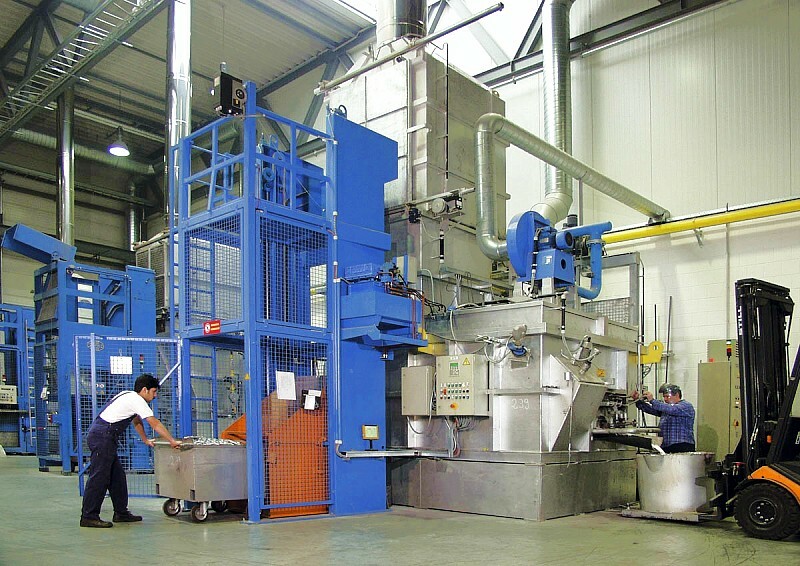 In case of metal removal of less than 150kg/h or if alloys have to be changed with a high frequency, espcially changes between copper-bearing and copper-free alloys, twin-chamber furnaces can be efficiently used only to a certain extent. If chips have to be re-melted, we recommend the use and/or the upgrade on a chip furnace. Shaft melting furnaces can also have one or two bale-out pockets (Fig. 4). These machines are often used at the manufacturing cells. 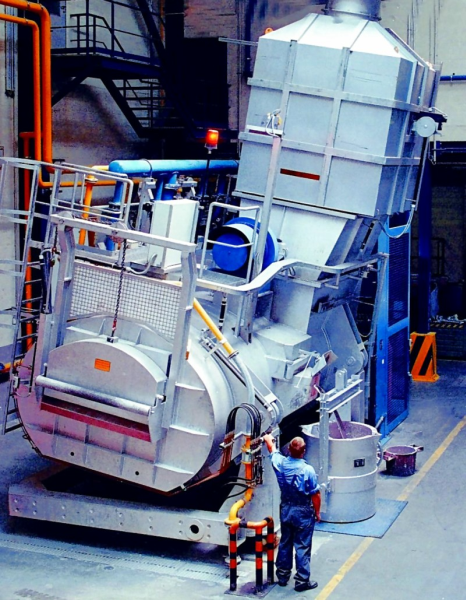 The metal is brought from the bale-out to the casting chamber through a ladle system. The cycle material which builds up in the cell is immediately added to the furnace again. The produced metal quality is sufficient for many mass products. Such cell solutions are characterized by a high profitability. The melting rate of aluminum shaft melting furnaces start at approx. 300kg/h and achieve up to 7,000kg/h in steps of 500 or 1,000kg/h. Adapted to the melting rate, the same aggregate provides for holding capacities of 500kg to 20,000kg. In general, melting and holding capacities can be randomly combined and adapted to all operational situations. A rule of thumb is that the size of the holdingbath (in the unit kilogram) should be at least one or two times the melting rate (in the unit kilogram). The accessible melting unit depends on the melting and holding processes and the charging good quality. The casting quality begins already in the melting furnace. 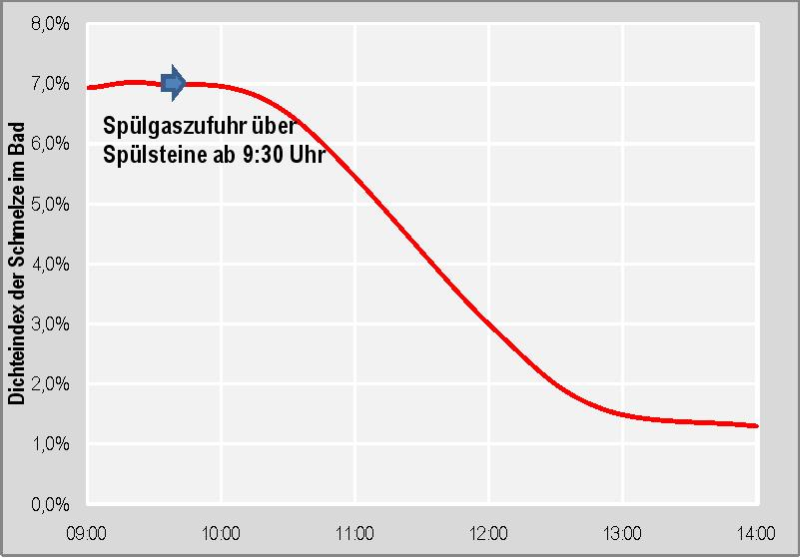 In general, melt density index values between 4 and 8 percent can be achieved for aluminum silicon standard alloys in twin-chambered shaft melting furnaces (Note: Information by StrikoWestofen GmbH for the StrikoMelter® type). This means that the produced melt can be used for die casting processes without much further ado. Due to a consistent separation of melting and holding areas, a high metal quality can be produced even if the charge material is of low quality. Dimensioning the holdingbath, especially limiting the bath depth to less than 600mm, as well as an even tempering through controlled burners are important factors for achieving a high metal quality. In addition, a high bath capacity enables a sufficient quiet period for the meld which also has positive effects on the melting unit. Measures taken on a shaft melting furnace show the optimum melting process and a good temperature control (measures taken on a StrikoMelter® from and by StrikoWestofen GmbH). Density index values between 4 and 5 percent were determined immediately after the quiet period in the transport ladle. In this case, the tapping temperature was 740 °C. In general, these low density index values are totally sufficient to transfer the melt directly into the bale-out or the dosing furnace without scavenging gas treatments and/or rotary degassing. In case of higher requirements for the casting parts, e.g. when producing heavy-duty ductile die casting alloys from ductile die casting alloys, or if low hydrogen contents are required, the melting process can already start in the melting furnace holdingbath by using a stirring plug (Fig. 5). The main tasks of the inert-gas flushing (nitrogen of argon) comprise the pre-cleaning of the melt through a quicker degassing (compared to the quiet process) as well as its thermal homogenization. The latter also reduces the energy consumption during holding. However, we do not recommend a flushing a holding chamber by using bottom stirring plugs if the furnace is used on a batch basis and/or if the chamber in most cases is widely emptied. Depending on certain alloy elements, melting temperatures of 800°C and more can cause an infiltration of melt in the stirring plug which reduces the efficiency of flushing and increases the flushing gas consumption. Fig. 6 illustrates the progression of the melt density index in the holdingbath of a twin-chambered shaft melting furnace after the it was started to inject the inert gas through stirring plugs. After a delay time, the density index continues to decrease. Since a low melting temperature of 700 °C was used for the process und the melt was very poor in oxidic and other solid impurities, an excellent density index end value of less the 1.5 percent was achieved.